A lot of that stuff isn't new (i.e.the web based call and ride reservation system already exists), although while the rationale for the service cuts might be, I only took it as that there were $1.2 million in cuts to offset $1.7 million in new expenses. I really doubt that Milwaukee Pulse is the cause, because it is offset by cutting 270 to once an hour and cutting off Allstate, probably is CMAQ money,anyway, and it should run more efficiently than the existing 270. Most of the studies (certainly the Joliet Express one) were undefined. 95th up next leaves Cermak and Halsted for the last of the near term projects. TSP corridors line up with the most-used routes, so I guess that was to be expected. For Burr Ridge, is it actually going to be a completely new one or just an expansion? The pdf doesn't specify. The Joliet Express Bus study will be interesting. I feel with all the current service, both Metra and Pace, anything new that doesn't also come with a park & ride would be duplicative, but I'm happy to be wrong. Not necessarily. If downtown Chicago commuters were the only intended market, I would agree with this, but we don't know any particulars of what will be studied yet. They could, for example, create an express route from Joliet to west suburban office centers (although a few previous attempts failed). 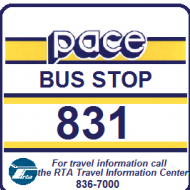 There is also potential for reverse commute buses to the Joliet area, similar to 361 or 754. I also noticed that $600,000 is allocated for an "Orland Square Mall Passenger Facility", probably planned to be something like the CTA terminal at Ford City. I forgot to mention that as well. It seems fairly unnecessary for what is essentially 3 infrequent routes with 30 & 60 min headways, even during rush and the mall serving as a shelter. Would the Joliet express serve in a capacity similar to 877/888/895 manner? All the above comments appear correct. On the undefined Joliet Express, the new Joliet TC (apparently finally got state funding) would be adjacent to Joliet Union Station, and Pace is not going to compete with the Metra RID. The South Cook-Will restructuring had proposals for extending 357 to Joliet, and a Weber Rd. flex route to Naperville, but nothing came of that. Maybe time to subsidize consultants again. The Orland Square TC is probably similar to Golf Mill, as 364, 379, 832, and the On Demand all terminate there. Note this does not correlate with model years in VIN's, though that can be explained by meaning "year paid for" not "year built"? Ever notice I mentioned it here? So can you explain the three extra 17500's? Have three never been accepted? All 71 are in the early 2018 fleet inventory. I never claimed that, in essence I said it couldin't be explained. You're acting like you were the first. 1. If coordinated with 511/512 (or similar potential future routes), it could be used to bring workers to Joliet. Otherwise I can't imagine this route getting many riders. 2. Coordination with Amtrak seems to be the key to this route. They seem to be thinking people will fly to O'Hare, take the bus to Joliet, then take the train downstate. There's also potential for rush hour riders, similar to 895's Chicago Ridge to Rosemont segment. 3. 655 (from Bolingbrook) failed, so this is dubious, but maybe Amtrak transfers could justify it. 4. 837, which ran from 1998 to 2000, failed. I'm not sure what has changed since then. Since it would serve an office corridor, Amtrak probably wouldn't help this route much. 5. My favorite route might be coming back, sort of. I guess this would have a similar rationale as #2. I assume you are referring to #4 of my post, to which I was thinking more about what companies were on the Naperville end. It's true there has been residential growth in Will County, but most of it isn't in the areas where people might ride a bus from downtown Joliet. Assuming the potential passengers are driving to work currently, they would likely find it more convenient to continue doing so than to take a detour and wait for a bus. Some riders might transfer from local routes, but as those routes mostly serve the older parts of town, I wouldn't expect ridership to be much more than it was 20 years ago. As I recall, 837 did not stop downtown, but at the Park-n-Ride at I-55 and US 30. That might be a better location for attracting drivers, but there's no local transfer opportunity to local routes unless you walk to the mall. *As evidenced that the last restructuring in Joliet was a cutback, except for Elwood buses subsidized by employers. **Joliet only gets you to the St. Louis route, while getting to Chicago Union Station gets you to any Amtrak route. And is somebody going to go from air to rail? The thinking is probably that a passenger would fly to Chicago either because it happens to be cheaper or a direct flight to St. Louis wasn’t available. I don’t know if Amtrak has done any research to show if people are already using it for this purpose, but it seems unlikely that many are. Amtrak doesn’t stop directly at the airport which means most people would prefer a connecting flight instead. Those that choose Amtrak would have to ride the Blue Line from O’Hare to Rosemont to catch the Joliet bus. If you’re going to do that, you may as well stay on the Blue Line to get to Union Station, which is already an option. So I agree the proposed route seems unnecessary for this purpose. 1. Blue Line to LaSalle then Metra Rock Island to Joliet. 2. Blue Line to Clinton, then Metra HC to Joliet. 3. From O'Hare, Peoria Charter to Mall in Joliet. Believe it or not, there are people the fly to Chicago and then ride Amtrak to their final destination. Some are tourists who come from the East Coast or Europe and ride the train to California. Other destinations are Carbondale, Bloomington, St Joseph, MI. Holland, MI., Springfield, Quincy. I don't think Amtrak would have much to gain by serving the airport. Logistically it won't happen thanks to CN. CP is too far from the airport. Other destinations are Carbondale, Bloomington, St Joseph, MI. Holland, MI., Springfield, Quincy. Only ones on that line are Bloomington and Springfield. Bus to Joliet is not going to get anyone to Carbondale (or Champaign). Only ones on that line are Bloomington and Springfield. Bus to Joliet is not going to get anyone to Carbondale (or Champaign). No one is going to go from O'Hare to Joliet to get a train to Bloomington, Springfield, or St Louis. Transportation to Joliet is too infrequent and not cost effective to warrant connecting there as opposed to Union Station. I agree. I was only noting where people were going from O'Hare which means they all have to go to Union Station. That’s what I figured. My point was, those taking Amtrak south from Joliet have to get on the Blue line to leave O’Hare. Given that constraint, would they see any advantage in transferring to a bus at Rosemont when they could stay on to Clinton (Union Station)? A trip from O’Hare to Springfield would cost $26.00 via Union Station and $21.30 via Pace to Joliet. But most people will have to wait few hours for the train, so they’d probably opt for Union Station despite the extra $4.70. 2) Joliet - Yorktown and/or Oakbrook - Rosemont? 5) Joliet - Bolingbrook/Old Chicago - Midway? These seem like the ones with the least amount of risk to start, although I don't know if their is a market for any of these services. There's also the issue of parking at B/OC, if they get a midway service, but this is just speculation. Seems like a waste of money. But thinking about it, there could be a small market for Bolingbrook to Midway service, or even Joluet- Bolingbrook-Midway service, but not for Amtrak. What if Pace made a route from the Downers Grove-Main Street Metra to Midway Airport via Main St, Ogden Ave, Pershing Road, and Cicero Ave? I feel like many people would benefit from this since it will connect businesses and residences along Ogden Ave and it will give residents of Berwyn and Stickney a closer East-West route to connect to other major streets easier such as Harlem or Cicero. It would also provide direct access to and from the Midway Orange Line.